Joeys Brother In TT "Snub"
Former Armoy Armada member Jim Dunlop has described his omission from a special tribute lap honouring his brother Joey at the Classic TT as an ‘insult’. Entitled ‘Joey Dunlop Road Racing Legend – The Rivals’ Parade Lap’ – the tribute will take place on Saturday, August 23, when 26 riders will complete a lap of the legendary Mountain Course, reflecting the Ballymoney legend’s record number of TT wins. However, Jim – who is the only surviving member of the Armoy Armada – has not been included in the line-up of Joey’s past rivals. World Superbike great Carl Fogarty plus Kiwi Graeme Crosby have been confirmed, with other names expected to feature including Ulsterman Phillip McCallen plus Joey’s former Honda team-mate Roger Marshall. 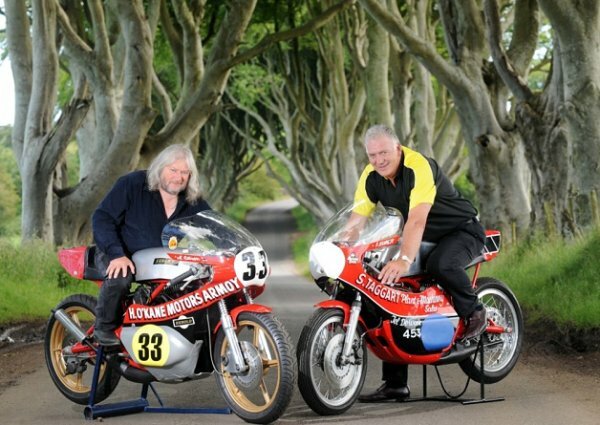 Armoy Armada members Mervyn Robinson and Frank Kennedy will be represented by Paul Robinson and Bill Kennedy respectively, while Michael Dunlop will ride his late father Robert’s iconic Norton. After raising the matter with the Isle of Man’s Department of Economic Development’s Motorsport Team, Dunlop has instead been invited to participate in a separate parade lap on Monday, August 25 and offered VIP hospitality tickets to the Classic TT. However, he says the proposal is an ‘afterthought’ and speaking at his Ballymoney home, Jim told the News Letter he has been left saddened by the decision. “I’m annoyed that I haven’t been asked to participate in Joey’s lap and it feels like a kick in the teeth,” he said. “I was a part of the Armoy Armada and raced against Joey; in fact I beat him too at times. The whole Armoy Armada is represented in Joey’s lap with other people filling in for Mervyn Robinson and Frank Kennedy, but I’ve been left out. I know that if Joey was here today he certainly wouldn’t have approved. “I’ve been asked to compete in the other parade lap on the Monday, but that’s more like an afterthought and the lap is nothing to do with Joey. It feels like an insult,” he added. “We’ve been told that the 26 riders taking part were decided by officers in the Department of Economic Development along with ‘respected representatives of the motorcycling community’. Jim says his exclusion from the parade is also an ‘insult to Joey’s memory’. In a letter sent to the Dunlops, David Cretney of the Isle of Man’s Department of Economic Development, said he was satisfied with the final 26-rider line-up. “I appreciate that any list of Joey’s greatest rivals will undoubtedly be subjective and provoke great debate, but we think that the riders chosen reflect both different decades that he competed in as well as the different meetings and championships that he raced in,” said Mr Cretney.